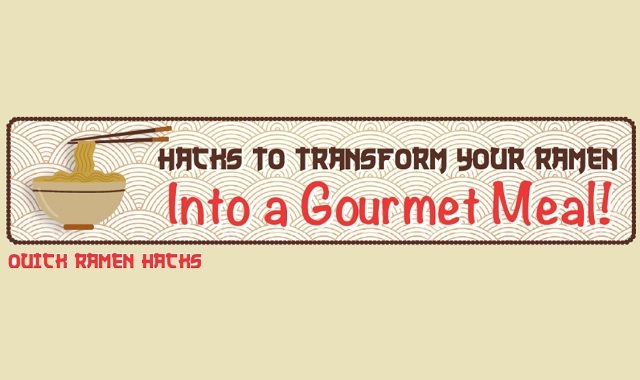 How to Transform Ramen into a Gourmet Meal #infographic ~ Visualistan '+g+"
Ramen has been keeping college students alive almost single-handedly since the 1980’s. While we all know that Ramen is a great budget-friendly food, not many people would associate it with a gourmet meal. Fortunately, there are a lot of ways that you can transform a bowl of Ramen into a culinary work of art. This graphic includes 20 variations, and a dozen recipes, to spice up your next bowl of noodles. Best of all, most of these hacks can be done using food you probably already have in your kitchen. If you’re into healthy options, there are several of them here. If you like your Ramen with an extra spicy kick, you’ll find some great options here, too. Best of all, if you like combining unusual ingredients to create unique flavors, you’ll find some special variations in this graphic! No matter your taste or budget, there’s a hack for everyone to make their next bowl of Ramen a full-on feast!